Hi, I'm Captain Andy and I own and operate the boat Good Times, a 47 ft Sheldon Midgette. I have over 20 years fishing experience. I am ready and equipped to show you and your friends, family or business associates how to have a great day of fishing in the waters of the Gulfstream. Good times is what you will get! You can fish for marlin, tuna, dolphin, wahoo and more on a full day offshore trip. Or you can fish for the smaller game fish on a 1/2 day inshore charter. 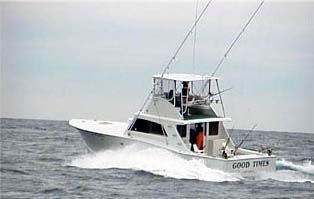 Sharking and bottom fishing trips also available. Whichever you decide my mate and I will do our best to provide you with a truly rewarding day! Call me at (252)216-9273 and I will help you decide what trip arrangements are best for your group. You can also book our boat through the marina by asking for the Good Times at (800)676-4939.